Brewed to a genuine old recipe, using traditional brewing processes and pieces of real ginger, Bundaberg Ginger Beer is gingery without being too spicy and sweet without being too sugary, with a distinct, fruity touch. This is about as genuine and old fashioned as you can get in the world of soft drinks! As a small hotel, we are delighted to have this product on board - especially when the sun comes out! It sells well on its own and doubles up when we run out of Crabbies when guests put a vodka in it, so, we get a double whammy! As a small hotel, we are delighted to have this product on board - especially when the sun comes out! It sells well on its own and boubles up when we run out of Crabbies when guests put a vodka in it, so, we get a double whammy! This is a lovely refreshing drink like no other Ginger Beer. 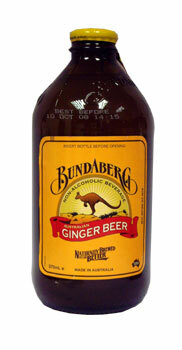 The Bundaberg brand tells you it will be good but it is just so full of sweet fresh ginger. Yum!